NOTICE: Activation key must be used on a valid Steam account. 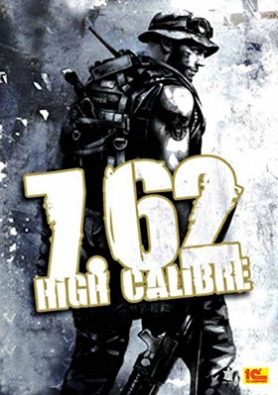 Requires internet connection.ABOUT THE GAME7.62 High Calibre is a tactical action game, sequel to Brigade E5. A professional mercenary seeks for a Russian “businessman”, who stole a lot of money from his “colleagues”, then hid in a small country of Latin America to avoid inevitable punishment there. Soon the assignment turns … into an intense and dangerous adventure, for there are many things that must be kept in mind – intricate political situation, confrontation between governmental military and rebels, not to mention a necessity to choose friends and foes wisely.KEY FEATURES Sequel to Brigade E5: New Jagged Union, the best strategy game according to the GameLand Award 2005, “Best Computer Games”, “GameLand” and “Game World Navigator” magazines. SPM (Smart Pause Mode) battle system combines RTS dynamics with diverse opportunities of turn-based gameplay. Over 150 accurately modeled firearms with possibility for upgrade. Varied ammunition as well as the extensive list of equipment. Non-linear storyline gives you an opportunity to make you own choice – to reach one of multiple endings Over 30 mercenaries. SYSTEM REQUIREMENTS Minimum: OS: Windows XP / 7 / 8 Processor: 2GHz Memory: 512 MB RAM Graphics: nVIDIA GeForce 5200 or ATI Radeon 9600 DirectX: Version 9.0c Hard Drive: 5 GB available space Sound Card: DirectX-compatible sound cardRecommended: OS: Windows XP Processor: 2,6 GHz Memory: 1 GB RAM Graphics: nVIDIA GeForce 6600 or ATI Radeon X800 DirectX: Version 9.0c Hard Drive: 5 GB available space Sound Card: DirectX-compatible sound card © 2013 1C Company. Developed by Apeiron. All rights reserved. Uses Bink Video. Copyright (C) 1997 - 2013 by RAD Game Tools, Inc. All rights reserved.